I have written several posts earlier on the Unique Learning System. The first post was an overview of the curriculum and the second contained additional resources. This post will focus on how to organize the materials that you create from the ULS. First, ULS offers such a myriad of materials that you can decide what you is appropriate for your students to print and make. Some, like the books, could be used on tools like the iPad or can be read on the computer using the PowerPoint supplementary files or the audio book tool in the curriculum itself. However, even if using technology to implement the curriculum, you will still have a large amount of materials to print, create/laminate, and organize. You will also want to organize the materials so that you can use them later in the year for maintenance and generalization of the skills taught as well as to use in future years. The first thing to think about as you make the materials is that many of the pictures for an activity look just like the pictures for the another activity in the same unit. I struggled with this the first time I assembled a unit because I had to go back to the online version to find which activity pieces fit with after I laminated them. Needless to say this added time to an already time-extensive activity of making the materials. So the next time I made a unit, I added labels to all the pieces before I laminated them. This was the quickest way, I found, to add information so that when pieces got lost I could relocate them with the rest of the materials. The picture below shows the system I used. In short, I used full page labels and created a table in MS Word that would have cells smaller than the small icons. I then copied the footer at the bottom of the PDF page from the activity and pasted it in the cells to create the stickers you see below. I then put a label on the back of each piece BEFORE I laminated them. This made it MUCH easier to assemble the activities once I had cut, laminated, and then cut all the pieces out of the laminate. So after I get them all cut out, I need to store them. I also need to store them long-term. Now in my case, I needed to transport all of my materials across the country to the classroom I was helping to set up. Consequently I needed something that closed the materials up and kept them from falling around my suitcase. As you can see below, I used plastic ziplock envelopes I got from an office supply store. 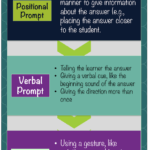 I put the lesson plan and all the materials for the lesson in the envelope and then could store them in the area they were needed in the classroom for easy access and reference. I realized later that I could have used much cheaper manila envelopes, although my sister says they attract bugs, so maybe the plastic was worth the investment. I would then assemble all the lessons, at the end of the month, into a box or file cabinet for storage for use later. 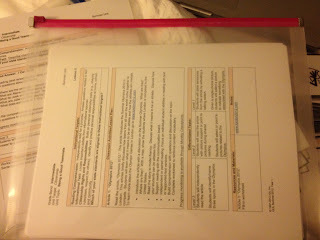 Finally, the blog Ideas from a Busy Bee offers these ideas for organizing the materials in her classroom. If you use the ULS, how do you organize your materials. Please share in the comments!! Thank you SO much for sharing my blog 🙂 can't wait to learn more from you too! Thank you SO much for sharing my blog! Thank you also for your first and second post.. will be reading up on those today! Busy Bee sorry it took so long to publish your comments. I love your blog and am always happy to share. How do you distribute the materials to the students and how do they keep them organized? I was thinking about having the students put the materials in a binder with a 5-tab divider separating their papers by each day of that week. I am not sure what to do with the materials once they have completed them. It's a whole lot of paper! I am new to using this program and I am in the process of printing the free summer unit to use for the first month of school. I have not heard back from my administrator whether they are going to purchase it otherwise I will buy it out of pocket! Hello! 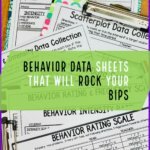 I know you posted this at the beginning of the year, but if you haven’t found a great system, I will share with you how I organize my ULS materials! I print out the Suggested Weekly Plan. It tells you what lessons to do each day! I do not do all the lessons as some of my students are higher than what the lessons instruct or I don’t like the lesson or whatever other reason. I highlight which ones I am going to use that week and then I print out those lessons. I know some people print out all of the lessons (which is like 600 pages total) each month but I just could not get myself to use that much paper. After I print out what lessons I am going to use, I put the materials in a binder for each student. Each student has a binder with 5 tabs (reading, writing, spelling, math and fluency). I put the materials for reading for the whole week in the reading tab. Then, I put an instruction sheet before all of the materials saying what materials are for which day and how to instruct the lesson (for my assistants mostly). I give each student a copy of the story and put it in the front pocket of the binder. In the spelling, writing and math tabs I put the lessons for that week that I chose for those areas. It’s all in one place and it includes instructions for subs or assistants if I give them a group to work with! I hope that helps (if you haven’t figured out a system already)! Thank you so much for sharing that system! Sounds like it works really well!! I do not currently use this curriculum, but I am looking into if for the future. However, I create lots of manipulative activities and file folder type games for my 5 year old, self-contained, multi-categorical classroom. How would you organize the manilla folder/plastic folders for easy access using hanging folders in a file cabinet? I am having trouble organizing them as a whole. Any suggestions? That's a great question. If they fit in hanging folders, then I think that's probably the easiest. However since most of them are made with file folders sometimes they are too large. A couple of thoughts about how to store them. First, I would store the pieces in a ziplock bag. The easiest way to store the ziplock bag so it stays with the folder, I think, is to use clear packing tape and fasten it on to the back of the folder. Cut a piece of tape a longer than the width of the ziplock bag and then place the bag on the back of the file folder and put the tape just under the closure / zip of the bag across it and leave a little leeway. This way you can still open the bag to put in and take out the contents, but the bag stays fastened to the back of the folder and you don't lose the pieces. I will do a blog post soon about this with picture to explain it better. If the folders don't fit in a hanging folder, I would consider a file box that is larger and store them filed in that box without enclosing folders. That way I can easily access them but I"m not trying to stuff them into folders that are the same size. Anyone else out there have ideas about how to store these types of manipulatives? Thanks for your posts on ULS. 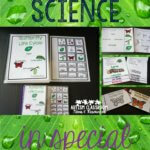 I use this curriculum for my elementary students with multiple disabilities. I am lucky that my county prints all of the materials on card stock for us every month. My biggest challenge is finding a way to store the materials once they are used. How do you store your monthly units to be used again in 3 years? Our county provided 3 ring binders but the materials are too thick to fit into one binder. I have limited storage in my classroom so this presents a problem when storing 3 years worth of curriculum materials. Any suggestions? I store the whole curriculum on a thumb drive each year for later reference. Printed materials go into an oversized binder each month, and materials for specific activities on cardstock go into zip lock bags in the front and back pockets of the binders. However, I have a recipe box with letter dividers that I use for the letter-sound picture sorts since I often pull extra pictures for the letters I am covering. i mark activities with the unit number, a decimal point, and the number of the lesson so I can quickly match materials to lessons. I also use that same decimal system to label the pieces on the back before lamination, when that is needed. 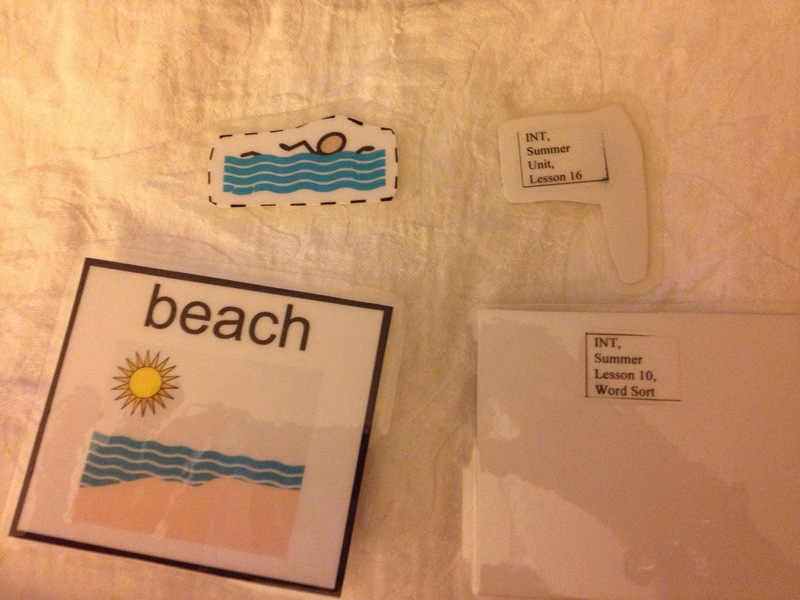 I use cardstock for manipulatives but do not always laminate everything that will be used only the one month. This is awesome! Thank you for sharing that!!! I would use ziplock bags or hanging folders to hold the pieces and the sheets that have been made. You could also use manila envelopes (the brown 8×11 or legal size mailing envelopes) with labels on the outside of them. I think there is a picture of that in one of the posts on the blog. I would just make sure you label the pieces and label the envelope. My sister, who is a teacher and uses the ULS, says the manila envelopes attract pests so she likes plastic ones. Some teachers use hanging folders in crates or boxes with the pieces in ziplock bags–that way they hold more. I would think 3 ring binders would be harder because of the bulky pieces. I would store them in hanging folders in a box that you can put away. I love this curriculum and the storage is difficult. I purchased accordian files with 31 slots so I put the lesson plans and printing guide up front and the rest of the lessons in by number. I ordered ten of them for the nine school months and the summer unit. Great idea. I am currently putting them in large yellow envelopes which are really not big enough. Thanks for the idea!! That's a great idea! Thanks for sharing that! I started saving all my ULS materials and realized it took up too much space! Now, I only keep copies of the stories, things I laminate and tasks I make. I have a thumb drive with all 3 years I've used. I thought they'd just repeat and I could reuse materials, they keep topics but change many of the stories/activities. At this time since we have to use the regular curriculm, I will link older ULS units to the curriculm we are using now. We still have access to ULS this year but the units don't match the regular curriculm! Thanks so much for sharing that! Yes I keep everything on the computer except the materials I make and laminate. 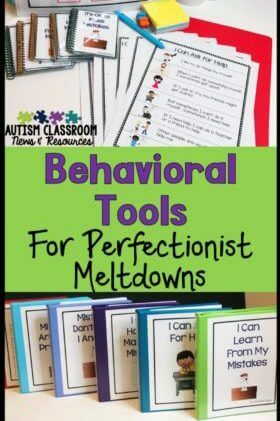 I am an new autism teacher and Unique learning looks like a wonderful tool. What are your suggestions on how to get started using the site? I know that they have made many changes to the site since I last subscribed to it. However, I would say the first thing to do would be to download the lessons. I will post on Facebook tomorrow night for ideas from current users, so you can check back there. If you don't do Facebook, let me know and I'll put a blog post together of the responses–I probably will do that anyway at some point but it will be sooner rather than later if you need it. This is my first year to use ULS. I understand it is different from last year (2014). I am very overwhelmed with all the lessons and the jumping around you have to do. I am also overwhelmed at the amount of printing which I have to pay for myself. Any thoughts on how I should get started or any new ideas you have for this year. I have so enjoyed reading your post in ULS. Do you have Facebook posts on ULS? That’s wonderful, Carrie! Good luck and let me know if there is anything I can provide information on that would help you! I use Unique units, but I actually pick and choose from each month in order to create my own thematic unit. I was finding that certain parts pertain to my state’s extended standards, and other parts didn’t. But, in the end, it worked out for the best because it meant I was printing and storing less! I keep my units in 3-inch binders. I put all my laminated materials in gallon ziploc bags, which I then hole punch and put in the binder. I also use dividers to organize by day, rather than by lesson. It took a LOT of time this summer to organize it all, but I am happy with the results so far! That is a great strategy Amy! Thanks for sharing!! I use ULS too and love it. This is my 2nd year using it and a still have so much to learn. So far the way I have been organizing it seams to work. What I do is I have 30 hanging files one for each lesson, when I get my print order ( my school has a print shop last year it was amazing and I could get my stuff in a week this year it is taking 3-4 so I am not getting my orders in time to prep them for the month I would love to hear how others handle the print side) I sort out the papers that need to be laminated, labeled, and whats is ready. Anything that is ready like my b&w copies the kids write on I put in the hinging file for that lesson. 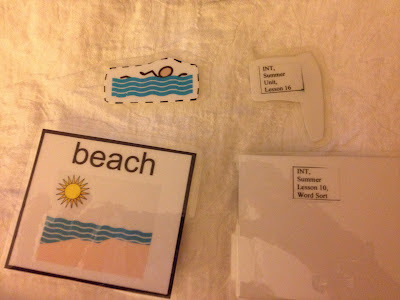 Anything I am going to cut up like the letter cards or sorting activities I label before I laminate. For my labeling I write the unit number and the lesson number on the back of each piece, so for my letter cards I would put 21.10 since for Feb it will be unit 21 and my letters are lesson 10. I write it by hand for each :(. 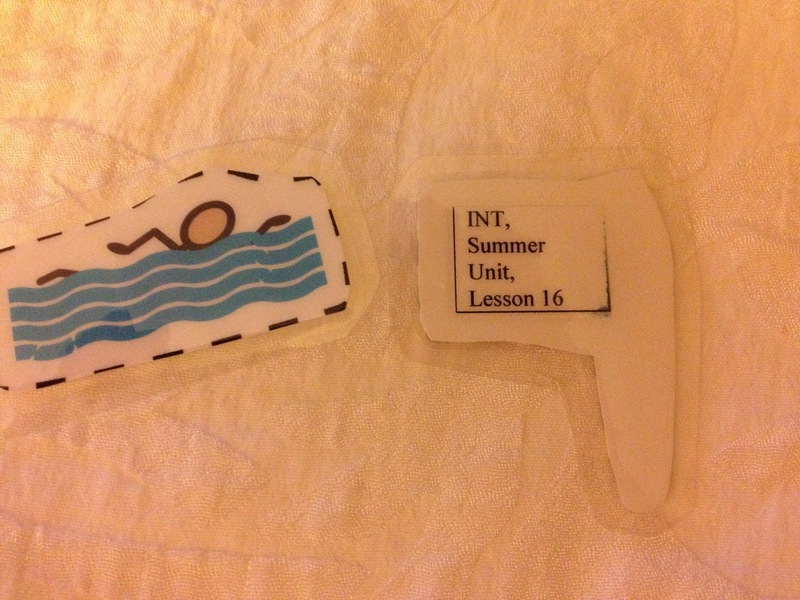 Once everything is laminated and cut I put them in the hanging file for that lesson number since it is a 3 year cycle if the holidays and summer units also cycle I will have 30 set. After last year I thought if I got file cabinets that were at least 26″ deep I could fit two month for each drawer witch would take up less room then 30 file boxes but this year the units are bigger and some take up a whole drawer on there own but also I have more student copies because we were not getting to a lot of the lessons and so I have a lot more paper left then last year. I also make a master binder for each month. I print a color copy of the whole unit and then group it by lesson in page protectors in a 3 ring binder. I keep the current month in a file box on my desk and then hand out papers to my kids as they need them for each lesson I teach 4&5th grade m/s they do keep the spelling in a folder in their desk. for finished work what I have found that works well for me is I have a file box at the back of my room and each kid has their name and picture on a hanging file and that is where they put all their finished work. Then every few weeks I can go through and pull stuff for IEPs send some home and some goes in the recycle. I hope this helps. Next week I can try to post some pictures of my files for people to see. I right now am trying to find new ways to print my ULS since I am not getting my color orders back in enough time to prep them and have them ready for the month. This is incredible! Thanks so much for sharing how you do this! My county is looking at the News2You program to start next fall. Thank you for the reviews as I prepare to make my recommendation to administration. I do have a couple of questions. What is the 3 year cycle that is mentioned? Do the months from year to year correspond (i.e., I can reuse some material year to year following their schedule)? Would it be beneficial to have a table for students’ to use? Does it work on non-iPad tablets (android based)? I’m sure I’ll have more questions but that is a start. Thanks in advance! Unfortunately I don’t know that I know all the answers to your questions as I am not affiliated with ULS. However the 3 year cycle is that the Unique Learning System (not News2You) repeats every 3 years…I believe there are some changes to what is offered but the idea is that you can use the same themes every 3 years because the students will have moved on. I don’t know about whether it works on non-iPad tablets–sorry but you can reuse the material year to year if you print them. Hope that helps. I know that ULS will be happy to answer your questions if you contact them through their website.